Requirements Management solutions enable companies to define and elaborate requirements and manage them throughout the development lifecycle and testing phases. Requirements are usually „owned” by clients and are typically determined by the market, an external force that is constantly changing – along with customer expectations. Since market demands and customers expectations change rapidly these days, requirements and requirements management documents must also do the same. The Waterfall approach is all about avoiding constantly changing requirements, and therefore avoiding having to update requirements all the time. The team starts the sequential process of development based on the requirements, meaning that all subsequent steps are based on these specifications. Since the Waterfall approach makes it very difficult to implement any changes, requirements might be updated during the development process but only those that are classified as „essential/vital”. Not updating requirements might help reduce the costs of develpoment, but it also makes it impossible for the team to see whether the product they are working on will still meet customer expectations. 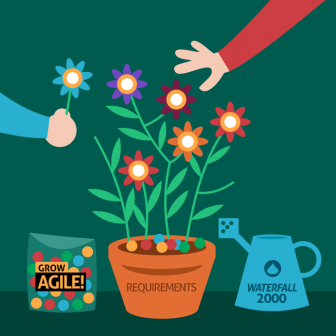 Requirements Management is considered one of the biggest weaknesses of the Waterfall method. Agile software development is a response to this problem. Agile software development enables requirements to change during the process of development, and allows development teams to implement changes in incremental steps. Due to iterative updates, teams can see and respond to changing requirements immediately. This enables them to deliver measurable value and to avoid wasting time on products or features that are no longer requested or required. Developers create a backlog of requirements, then break this down into deliverable components. The backlog essentially guides the process of development, and the process may be steered to the right direction with the start of every iteration. While they might seem fundamentally different, blending the benefits of Agile and Waterfall is possible. That is exactly what the Agile-Waterfall Hybrid methodology aims to do. This Hybrid methodology is in fact widely used by product development teams worldwide. 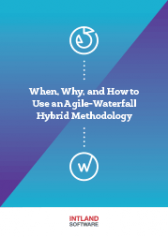 By adopting the Agile-Waterfall Hybrid method, software development teams can gain some of the flexibility of Agile while maintaining the structured approach of Waterfall. Agile elements help adapt to changing requirements, while using the Waterfall structure makes sure that there's adequate planning before the project starts. Requirements in a Hybrid project may be managed several ways. As this methodology is generally applied by developers of complex products, Waterfall might be used for hardware components, while Agile greatly supports the development of a product's software components.